Everyone’s favorite Parks and Rec dork turned Jurassic World hunk, Chris Pratt is preparing for his most important role yet. He’s about to star as the left-handed leading man, Michelob Michelstein in the all-new Michelob ULTRA commercial. Or wait, is his name actually Tommy Ultra? The actual commercial for Michelob ULTRA, starts off with Pratt exuberantly receiving a call letting him know he’s gotten a part in the Michelob commercial. A commercial in a commercial. Meta, right? Pratt then vigorously starts training for the role, running around town, confident and a little cocky with his newly crowned titled as a Michelob spokesperson. He even begins working out with a personal trainer, lifting weights while yelling the beers name with each rep.
Pratt cares so much about the role, he takes on the role as a method actor, fully immersing himself in the Michelob lifestyle. It’s only then when he “realizes” his character is left handed. While contemplating names for his character, Chris Pratt starts doing reps with a beer bottle, before taking off his shirt, which is obviously part of his character’s mentality and not a cheap marketing ploy to leave us all in a puddle of our own drool. At one point Pratt practices how to drink from a bottle, by gyrating small phallic weights towards his mouth, which totally doesn’t look like a BJ. Finally, Chris Pratt makes it onto the set for his big day starring in the Michelob commercial. Only to find that he’s being directed to a group of extras. Don’t worry, Chris. You’re still our leading man. 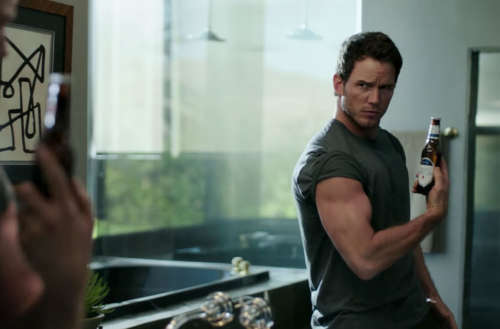 Watch the Chris Pratt Michelob ULTRA commercial below, and revel in his studliness.